Decanter Mamba Double Magnum Limited Edition kun 1950/88 260 stk. produceret. February 2016 – The design of the Mamba Double Magnum references the groundbreaking 2011 design of the Mamba decanter, which caused a global sensation. 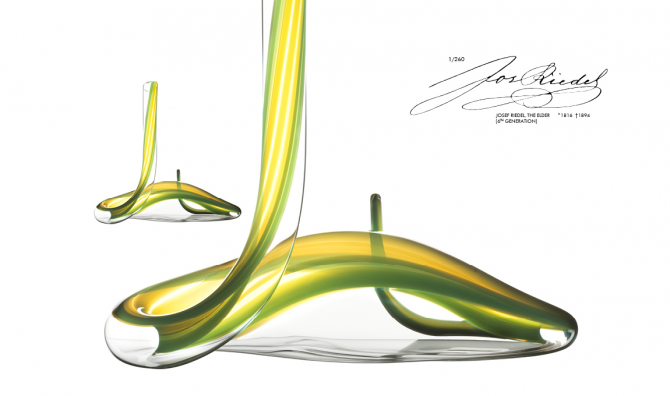 For 2016, the 260th anniversary of the family-owned company, Maximilian J. Riedel, CEO of Riedel, developed a unique vessel which pays homage to the company’s venerable past while at the same time representing its role as a leader in glassware design today. He set his glassblowers to the almost impossible task of producing the highly complex and difficult design of the Mamba decanter in double magnum format. The glassblower Jan Kocek at the glassworks in Kufstein, Austria rose to this enormous challenge in exemplary fashion: crafting this elaborate decanter requires supreme skill and craftsmanship. Mouth blown from lead-free crystal and shaped by hand, it impresses through its design, ist perfect execution and its functionality. deserve,” says Maximilian J. Riedel. Decanter Mamba Double Magnum Green 1950/88. https://riedelshop.dk/wp-content/uploads/2014/07/1950-88_neuheiten.png 396 670 Riedelshop.dk https://riedelshop.dk/wp-content/uploads/2019/03/Riedel-logo-final-black-250v1.png Riedelshop.dk2015-11-17 09:36:582016-07-06 07:23:01Decanter Mamba Double Magnum Limited Edition kun 1950/88 260 stk. produceret. Georg Riedel afholder seminar for Winemakers Central Otago. Valuepacks storkøb!